Your brochure is an easy way to market yourself, your products or your company. These brochures are effective promotional tools that no business should pass up. They're versatile, flexible and affordable. With brochures you can create an outstanding marketing campaign with a limited budget. They can boost your market presence and they work well with other marketing mediums. Brochures come in many folding styles: bi-fold, tri-fold, 4 panel folds and more. Choosing the right fold that compliments your product and brand is hard. The more folding options you have the better chances you have in finding the perfect fit. We can offer you a variety of options. 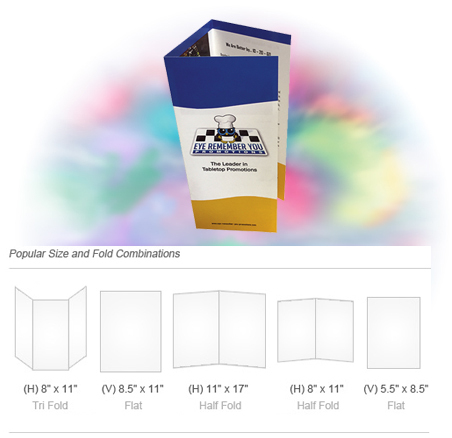 We have multiple folding formats you can select from. Pick a stand size or get a customized one that will go well with your fold choice. Our brochures are printed on glossy, matte and uncoated paper or card stock. Of course, other stock options are available. Standard stocks are 80 lb. gloss. We also offer UV Coating on book covers.. UV coating is a liquid laminate applied just after printing and cured by UV lights. It is specially formulated to provide additional protection against sun fading, scuffing and abrasive scratching to your brochures.